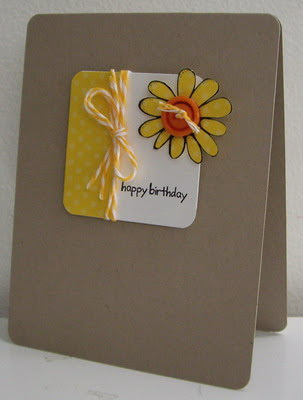 Today I've made a card for two challenges - CAS-ual Fridays (CFC51 - Happy Birthday) and Clean & Simple Sketch (FTL 189). I used the Melonheadz free digital stamp of a sunflower, printed onto Daffodil Delight polka-dot DP and cut out the flower head. Added a button and some twine and voila ... a quick and easy card. Hope you like. I printed off the digital image onto polka DP and cut out the flower head. I threaded twine through the button holes, tied a knot and secured the button to the middle of the sunflower with two glue dots. I cut out a 2 1/4" square piece of Whisper White cardstock. I cut a 7/8" strip of Daffodil Delight polka-dot DP and adhered it to the one side. I used the corner rounder to round all the corners ... as well as the four corners of the Crumb Cake card base. I stamped the sentiment in Basic Black ink onto the square panel. I wrapped two strands of twine around the panel and tied a bow, securing the bow in place with a glue dot. I mounted the square panel onto the card base, popping it up with dimensionals to add depth. I added the flower on top, also popping it up with dimensionals to add depth. Labels: birthday, CAS, digital stamps, paper piecing, Stampin' Up! your card is really cute. I love the baker twine and the little flower. Loll, your card is so pretty and bright! Nice! Love the craft base with the bright central panel. I love the bright colors against the kraft, and overall "fun" feel of your card. Thanks so much for playing along at CAS-ual Fridays! Really beautiful card, love the clean and simple! Absolutely delightful! Love the colors, twines and button details!! Thanks so much for joining the birthday celebration with us at CAS-ual Fridays! This is adorable! The polka dots and yellow twine are so cheery, and your sunflower looks super cute. Thanks for helping us celebrate at CAS-ual Fridays! Completely adorable! Thanks for celebrating with us at CAS-ual Fridays!